1. Where did you meet your husband? 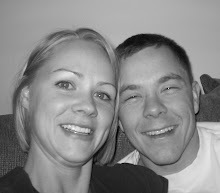 Shane and I met at Utah State University. (this is kind of long so bare with me). We had several sports classes together, and several times during our football class the thought would come to me "Man that guy would be perfect to be married to, then I would say to myself are you kidding me he is so out of your league." that was in Aug and Sept. Well in Oct we had volleyball and basketball after a few weeks into these classes I started noticing that every once in a while a stray basketball or volleyball would be coming my way (we still haven't said a word to each other yet) that started happening after he witnessed me complete 11 lay-ups in 1 min (and not to mention my jump shot). Then came swimming class in November :) Two days after Turkey day Shane came to my work and asked me out (he had a friend with him for moral support). We have been inseparable since. 2. What is the first thing you said to your husband? Hi, what are you doing here? 3. Where was your first date? We started off first at his grandma Cheney's (every Wednesday he would drive to Bear River to visit his grandma) and the date happened to be on Wednesday. She was so cute we had dinner (take out from Peach City and watched Wheel of Fortune), when it was time to leave(we were meeting Shane's buddies in Layton). Shane took me to the car, ran back into the house to say good bye to his grandmother, she told him to take one of her roses from her garden and give it to me. (she helped him out a ton when it came to the romantic stuff :). I can't remember what movie we saw because we ended up walking out on half of it and went to the last part of Monster's INC.
5. 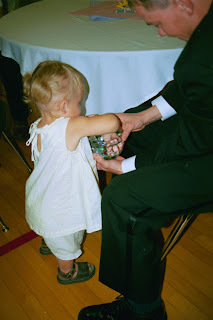 Did you have a long or short courtship/engagement? We dated for 4 weeks and engaged for 5 months. 7. Where were you married? 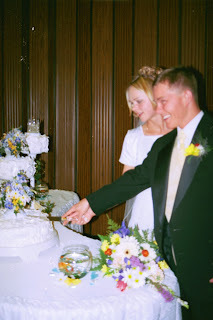 We were married on May 11, 2002 in the Salt Lake Temple. I had to be up at 4 am to have my hair done..(if I could do it over again I would have done it myself :)... and to top it off we were married at 7am... ( I would change that also:) it was cute the temple worker came in the bride room and said "Shane looks really sick... should I offer some saltine crackers?" 9. How was the honeymoon? It was awesome. Shane and I had planned to stay in SLC at the anniversary inn (not impressed) we didn't have much money. Luckily Shane's buddies got us tickets to fly out to Las Vegas and a two night stay at the Hard Rock Hotel. We had a blast other than paying 10 dollars for a foot long subway sandwich. Loved reading about your 'love' story! that was cute. I think it is cute that Shane's grandma made him take a rose to you. AWWW! !